Drought is a shortage of precipitation over a season or more, as in California where four years of drastic declines in rainfall and snowpack have created severe watering cutbacks. The definition of a drought's severity isn't solely based on the degree of shortage and the length of time it persists. It's also defined by what and whom it affects -- agriculture and food production, the environment and wildlife, businesses and homeowners, people in the immediate vicinity and people far beyond. Xeriscape, a water-conserving form of landscaping, is an effective method for planning gardens for dry conditions whether caused by drought or natural climate. We'll talk about xeric, or low water, plants at the end of this article. The National Drought Mitigation Center (NDMC), which is based at the University of Nebraska in Lincoln, calls drought a "creeping phenomenon" that spreads with varying impact from region to region. Even if a region of the country has sufficient precipitation, it may suffer due to shortages elsewhere. For example, drought in important agricultural and ranching areas raises the cost of food nationwide when crops fail or are meager. Prolonged drought shrinks reservoirs, turns waterways into trickles and depletes groundwater. In its May 2008 Drought Public Fact Sheet the National Weather Service points out that regions are interconnected by these hydrologic systems, and this also causes the impact of drought to extend "well beyond the borders of the precipitation-deficient area." Lack of rainfall and stored water for irrigation may cause soil to compact and become more alkaline. This causes soil to be less absorbent -- a condition called hydrophobia. 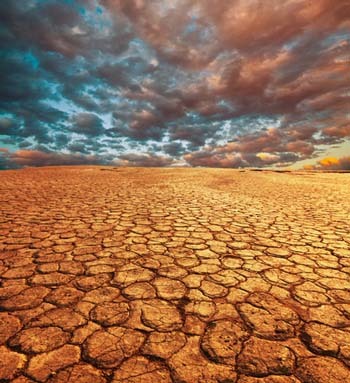 A naturally dry climate -- such as in the deserts and semi-arid lands of the West -- often leads to hydrophobic soils. This explains the May 15, 2015, flash flooding at San Diego International Airport when about 1.5 inches of rain fell in 90 minutes -- a soaking easily absorbed in areas more accustomed to rain. But don't confuse an area's historically natural aridity with drought. The historical average for annual rainfall in San Diego is only about 10 inches. However, statistics from the San Diego County Water Authority show that figure began plummeting in 2012, sinking to slightly less than 8 inches of rain that year. The following year, the number decreased again by about 1.5 inches. Then in 2014, San Diego received only a tiny bit more than 5 inches. Now that's drought. We won't even venture into an explanation of matters such as El Niño and shifting weather patterns. But it's worth noting that May is generally a dry month in much of California, where a Mediterranean dry summer/wet winter climate usually prevails. May usually is damp in Massachusetts, but in 2015, the U.S. Drought Monitor of the NDMC classified the shortfall of precipitation there as falling into "abnormal dryness" and "moderate drought" -- the first two levels of shortage. Estimates received during a telephone interview with a representative at NOAA's Earth System Research Laboratory in Boulder, Colorado, show that May 2015 rainfall in Massachusetts was only about 1 inch or roughly 3 inches less than normal. The precise definition of how long such a shortage must exist to be called drought is unclear. However, Massachusetts registered no or little shortage from November 2014 to the end of March 2015, so it doesn't really fit the definition of drought. In contrast, NOAA estimates that Colorado, which usually has about 1.75 inches in May, was roughly 3.5 inches over its historic average. Despite raising the state out of a multi-year drought, Colorado's sudden abundance of water didn't change the fact that the state has a naturally dry climate requiring waterwise choices in the garden. You don't have to live in red rock or chaparral country to benefit from the principles of xeriscape. It's a technique that minimizes lawn and watering. Xeric planting requires analyzing the characteristics of your yard -- including damp and dry spots as well as variations in sun exposure -- and grouping plants with similar cultural needs. For an explanation of this gardening technique, please read Xeric Choices: Xeriscape Basics & Ancient Ideas in our Everything Salvias Blog. Keep in mind that good xeric choices vary based on regional growing conditions, including rainfall and soil quality. Salvias are colorful, efficient plants for xeric gardening. If you live in the Southwest, you may want to consider some of the most drought-tolerant choices we grow at Flowers by the Sea. One easy way to sort through the offerings in our online catalog is to click on the Salvias by Culture category in the website menu atop our homepage. It opens to a window allowing you to navigate to subcategories, such as Drought Tolerant. This queue leads you to all of our salvias that are likely to survive drought, even if they prefer regular supplemental watering when conditions are hot and dry. Before choosing any plants, remember to check their U.S. Department of Agriculture Plant Hardiness Zones to determine whether they're likely to survive winter temperatures in your area and to re-emerge in spring. Celestial Blue Sage (Salvia x 'Celestial Blue') Zones 7b to 11. Many regions go in and out of drought or have climates that swing from seasons with almost no precipitation to periods of monsoon, such as the Southwest. Among the plants in our catalog categorized as having "average" water needs, many can handle swings from dry to damp (depending on severity) but prefer conditions somewhere in the middle of those extremes. To select plants with this capability, look for ones described as having an average need for water. If you are just beginning to grow salvias in your gardens, FBTS offers a series of Getting Started articles on a wide variety of topics about sages. You don't have to be a horticultural pro to start gardening in a way that will conserve water yet result in a pretty, long blooming landscape. Gradually adding low-water salvias and companion plants to your landscape is a good way to get started xeriscaping. Just remember to group plants with similar cultural needs together. The quickest way to fail in your garden is to ignore varying needs, such as putting shade plants in locations meant for full sun species or combining water loving species with drought-tolerant ones. If you have questions about any of our plants or how they might fit into your garden, please call or email us. We're glad to help you get started toward becoming a Salvia pro.